Designed by architect Henry G. Fiddelke. 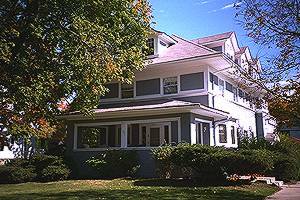 The Hemingways left their house at 339 Oak Park Avenue when Grandfather Hall died. With part of Grace Hemingway's inheritance from the sale of her father's house, the Hemingways built a new home at 600 North Kenilworth Avenue, just a few blocks away from his birth home. Hemingway spent his high school years in this large "modified rectilinear" house.